The Maine Department of Transportation in partnership with Acadia National Park and the Friends of Acadia invite the public to attend a meeting to discuss a proposed intermodal transportation center and welcome facility for visitors to the region. This facility is proposed to be located on the “Crippens Creek” property, located on Route 3 approximately 1.5 miles south of the intersection with Route 204, and highlighted on the attached map. The public meeting will be held on Wednesday, February 1st at 7:00 PM in the multipurpose room of the Trenton Elementary School located on Route 3 in Trenton. 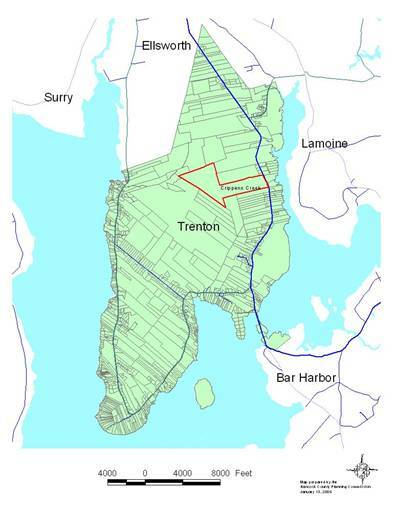 Staff from the Maine Department of Transportation and DMJM Harris, an environmental consulting firm, will describe the planning process, opportunities for public participation and answer questions. Representatives of the Trenton select board and comprehensive planning committee will also be on hand to participate in the discussion. The proposed facility would enhance transportation alternatives for visitors to the region, particularly day-visitors to Acadia National Park and Mount Desert Island. This site would provide a center for operating and maintaining the Island Explorer transit system and may include additional public amenities pending outcome of the design and evaluation process. Currently the MaineDOT and DMJM Harris are evaluating environmental conditions of the Crippens Creek site. This evaluation will continue through the spring of 2006. The Hancock County Planning Commission is providing assistance in public outreach, planning and project coordination. For additional information, contact Jim Fisher at jfisher@hcpcme.org or 667-7131. Visit www.hcpcme.org/landuse/trenton/trentonplan.htm for more information on planning in Trenton.